Rescue workers removing bodies from the Egyptian embassy in Islamabad. 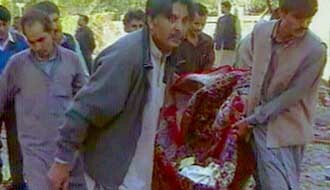 [Source: Canadian Broadcasting Corporation]The Islamic Jihad blows up the Egyptian Embassy in Islamabad, Pakistan. 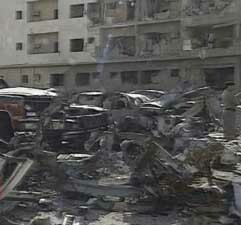 Two cars filled with explosives crash through the embassy gates, killing the bombers and sixteen others. Ayman al-Zawahiri will later write in a book, “The bomb left the embassy’s ruined building as an eloquent and clear message.” Islamic Jihad is already closely tied to al-Qaeda by this time. [New Yorker, 9/9/2002] The Egyptian government had recently dispatched up to 100 government agents to London with the task of eliminating militants opposed to the Egyptian government. The Independent will later report, “Sources in Cairo said that several of the dead embassy officials were working under cover as diplomats to help the Pakistani authorities track down” militants. In the wake of the attack, plans to send more Egyptian government agents to Pakistan to hunt militants in that region are scuttled. [Independent, 12/6/1995] Some of the money for the bombing operation was apparently raised by al-Zawahiri on a fundraising trip to the US (see Late 1994 or 1995). 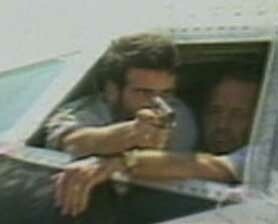 One suspect, a Canadian citizen named Ahmed Said Khadr, will be arrested in Pakistan a short time after the bombings. 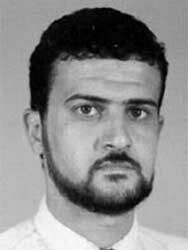 He will soon be released at the request of the Canadian prime minister, but will later be revealed to be a founding member of al-Qaeda (see January 1996-September 10, 2001). The American Petroleum Institute asserts that the states bordering the Caspian Sea, north of Afghanistan, contain two-thirds of the world’s known reserves, or 659 billion barrels. Such numbers spur demand for an Afghan pipeline. However, by April 1997, estimates drop to 179 billion barrels. [Middle East Journal, 9/22/2000] This is still substantial, but the estimates continue to drop in future years (see November 1, 2002). 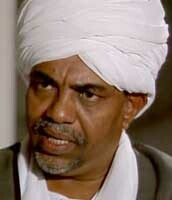 Crown Prince Abdullah. 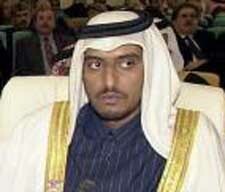 [Source: Corbis]King Fahd of Saudi Arabia suffers a severe stroke. Afterwards, he is able to sit in a chair and open his eyes, but little more. He slowly recovers from this condition. The resulting lack of leadership begins a behind-the-scenes struggle for power and leads to increased corruption. Crown Prince Abdullah has been urging his fellow princes to address the problem of corruption in the kingdom—so far unsuccessfully. 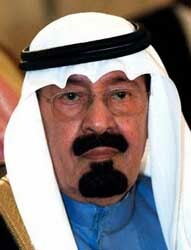 A former White House adviser says: “The only reason Fahd’s being kept alive is so Abdullah can’t become king.” [New Yorker, 10/16/2001] This internal power struggle will continue until King Fahd dies in 2005 and Abdullah becomes the new king (see August 1, 2005). Mustafa Setmarian Nasar. 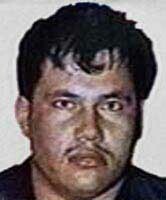 [Source: Public domain]Spanish intelligence learns that al-Qaeda leader Mustafa Setmarian Nasar, a.k.a. Abu Musab al-Suri, has visited Mamoun Darkazanli in Hamburg this year. Darkazanli is an associate of the 9/11 hijackers living in Hamburg. The Spanish are aware of Nasar due to his links to Barakat Yarkas, as Yarkas and his Madrid cell are being monitored (see 1995 and After). It is unknown if the Spanish realize that Nasar is an important al-Qaeda leader at this time, but they do learn that he met Osama bin Laden. 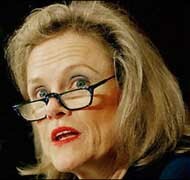 [National Review, 5/21/2004; Brisard and Martinez, 2005, pp. 109-110, 195] Nasar receives $3,000 from Darkazanli while living in Britain in 1995 through 1996. This is according to German police documents, and it is unknown if German and/or Spanish authorities are aware of this link at the time. [Chicago Tribune, 7/12/2005] In 1998, the Spanish will discover that Darkazanli and Yarkas are in frequent phone contact with each other. They share their information with the CIA (see August 1998-September 11, 2001). 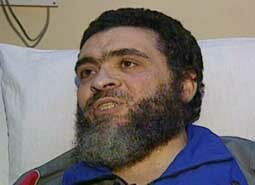 Nasar leaves Britain in 1996 after realizing the British authorities suspect his involvement in a series of 1995 bombings in France (see July-October 1995). [National Review, 5/21/2004] He will be arrested in Pakistan in 2005 after the US announces a $5 million reward for his capture (see October 31, 2005). Many high-ranking Yemeni government officials help al-Qaeda and other militants, beginning in 1996, according to Abdulsalam Ali Abdulrahman, a Yemeni official who will be captured after 9/11 and sent to the US prison in Guanatanamo, Cuba. 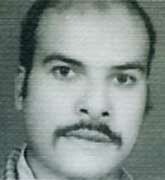 Abdulrahman is a section chief in Yemen’s Political Security Organization (PSO), the Yemeni equivalent of the FBI, until his arrest in 2002 (see September 2002). 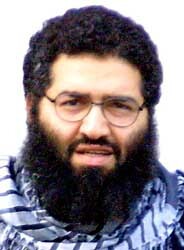 His 2008 Guantanamo file will state: “Detainee stated that since 1996, numerous high-ranking employees in the Yemeni government and PSO were involved in aiding al-Qaeda and other extremists through the provision of false passports and by giving them safe haven out of the country under the guise of deportation. These PSO officials included detainee; Mohammed al-Surmi, deputy chief of the PSO; Ghalib al-Qamish, director of the PSO; Colonel Ahmad Dirham, commander of the Deportation Department in the PSO; and Abdallah al-Zirka, an officer in the Yemeni Passport Authority. 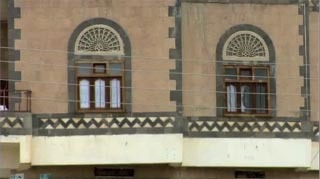 According to detainee, the second highest ranking person in the Yemeni government, Ali Mohsen al-Ahmar, was aware of the involvement of al-Surmi and al-Qamish in these activities since at least 1999.” An analyst notes in the file that Mohsen is the (half) brother of Yemeni President Saleh. [US Department of Defense, 9/24/2008] Note that this is based on Guantanamo files leaked to the public in 2011 by the non-profit whistleblower group WikiLeaks. There are many doubts about the reliability of the information in the files (see April 24, 2011). However, it should also be noted that other information corroborates the charges, including the involvement of some names mentioned by Abdulrahman (for instance, see Spring-Summer 1998, After July 1994, December 26, 1998, and April 27, 2005). In early 1996, while US officials are waiting from approval from officials in Qatar so they can arrest Khalid Shaikh Mohammmed (KSM) there, the Qatari government tells the US that it fears KSM is constructing an explosive device. They also say that he possesses more than 20 different passports. [Los Angeles Times, 12/22/2002] By this time, the US is aware of KSM’s involvement in the 1995 Bojinka plot involving explosives (see January 6, 1995) and his role in the 1993 WTC bombing (see March 20, 1993). After 9/11, there will be media accounts suggesting some of the 9/11 hijackers trained at US military bases (see September 15-17, 2001). According to these accounts, four of the hijackers trained at Pensacola Naval Air Station, a base that trains many foreign nationals. One neighbor will claim that Ahmed Alghamdi lived in Pensacola until about August 2000. This neighbor will claim that Alghamdi appeared to be part of a group of Arab men who often gathered at the Fountains apartment complex near the University of West Florida. She will recount, “People would come and knock on the doors. We might see three or four, and they were always men. 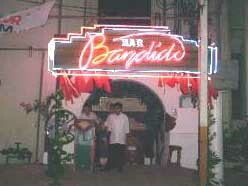 It was always in the evening. The traffic in and out, although it was sporadic, was constant every evening. They would go and knock, and then it would be a little while and someone would look out the window to see who it was, like they were being very cautious. Not your normal coming to the door and opening it.” [New York Times, 9/15/2001] It is not known when Alghamdi is first seen in Pensacola. 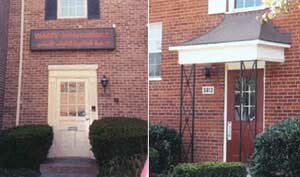 However, he uses the address of a housing facility for foreign military trainees located inside the base on drivers’ licenses issued in 1996 and 1998. 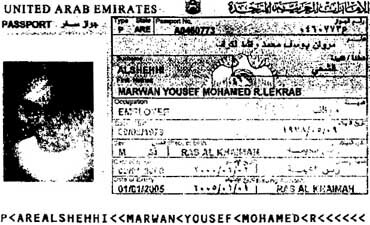 Saeed Alghamdi and Ahmed Alnami also list the same address as Ahmed Alghamdi on their drivers license and car registrations between 1996 and 1998. Other records connect Hamza Alghamdi to that same address. However, the Pensacola News Journal reports that “The news articles caution that there are slight discrepancies between the FBI list of suspected hijackers and the military training records, either in the spellings of their names or in their birth dates. They also raise the possibility that the hijackers stole the identities of military trainees.” [Washington Post, 9/16/2001; Pensacola News Journal, 9/17/2001] It is unclear if these people were the 9/11 hijackers or just others with similar names. The US military has never definitively denied that they were the hijackers, and the media lost interest in the story a couple of weeks after 9/11. 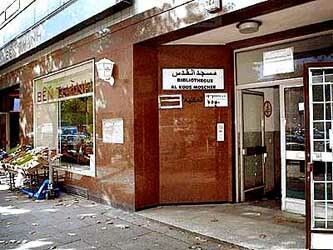 The Algerian Groupe Islamique Armé (GIA) gains more influence in the Islamic Cultural Institute, a militant mosque in Milan, Italy, following the death of its former head, Anwar Shaaban. 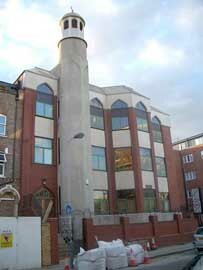 Under the leadership of Shaaban, who died in the Bosnian war, the mosque had been built up into a key European logistics center for militant Islamists. [Chicago Tribune, 10/22/2001] The mosque is described as “the main al-Qaeda station house in Europe” (see 1993 and After), but the GIA is said to be infiltrated by government informers at this point and is losing strength in Algeria due to the penetration (see October 27, 1994-July 16, 1996). The Federal Emergency Management Agency (FEMA) reportedly considers using an E-4B National Airborne Operations Center during the Atlanta Olympics. The reason for this is not known, but it could be related to terrorism fears, including a possible air attack (see January 20, 1997). [Federal Computer Week, 6/2/1996] An aviation website will later show a picture of an E-4B taking off from Dobbins Air Reserve Base in Marietta, Georgia on May 14, “after crew attended meeting with FEMA prior to ‘96 Atlanta Olympics.” [Airliners.net, 2000] However, there are no reports on whether an E-4B is actually used during the Olympics.